Why not create your own designs and photos printed on personalised sweatshirts for men as custom presents or additions to your own wardrobe? High-quality printing on high-quality sweatshirts, easy to design and quick delivery. 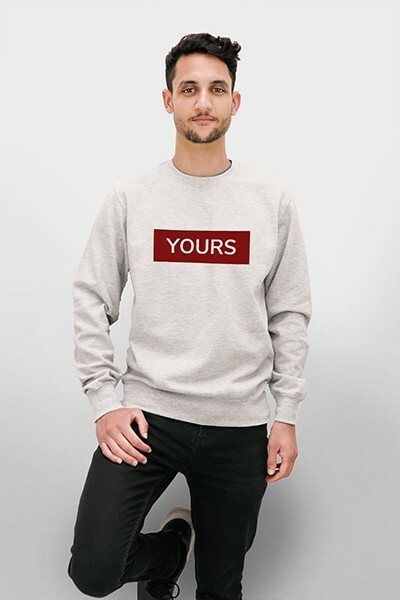 Stand out from the crowd by determining your own style and message, with our personalised sweatshirts. Comfortable, warm, and versatile, sweatshirts make up an important part of a man's wardrobes. Now with the possibility to create custom sweatshirts using your own photos to make wonderfully unique designs, you can let your imagination run wild. The perfect gift for a friend or family member is just one inside joke and a personalised sweatshirt away. Our customizer gives you enough power to create incredible designs while making the design process accessible to almost anyone. In three simple steps, you can create personalised sweatshirts that everyone, especially you, will love. Design your own sweatshirt today. Designing personalised sweatshirts for men is easier than you think and it can be done in as little as five minutes. Choosing between your favorite photos or designs might be the hardest part. If you are lacking inspiration, we’ve also got designs for you to use. In as little as five minutes, you can upload your photos via your laptop, phone, or social media account, make any image adjustments like resizing, add emojis or text and finally, check out. We’ve made it easy so you can focus on what matters, an amazing design that you will love on your new sweatshirt. You decide what you wear from now on. Design your own men's sweatshirt today. Almost immediately after you have finished your design and submitted your order, we’ll start producing your personalised sweatshirts. Your personalised sweatshirts will be printed using high-resolution printers in full colour, for a men's sweatshirt that will catch a lot of people's attention. After your sweatshirt has been printed and checked for imperfections, we’ll box it up and ship it to you. We’ll also send you a tracking code, so you can track its progress and know exactly when it will arrive. If only everything in life were this fast and easy. Please make sure to carefully verify all your order details, before finalizing your order. Design your own sweatshirt today and wear it with pride.